Atom is a small firm that specialises in bodyboards, and because they are set firmly within this niche, you know that they are going to deliver on quality. There’s no doubt that quality is important when it comes to bodyboards, with the construction, the bottom of the board and the leash all being important aspects of the overall package. Atom deliver bodyboards that are perfect for the beginner bodyboarder, but literally all of their products have quality and longevity written all over them meaning no matter how far you want to take this sport, you can do it on an Atom. 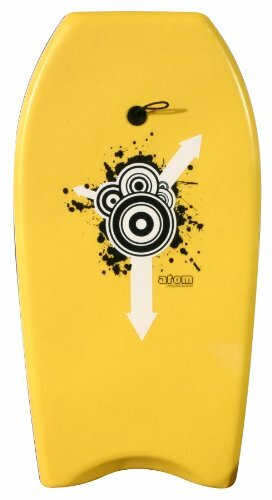 The Atom Bodyboard is quite simply one of the most versatile bodyboards we have come across in this price range. Undoubtedly aimed at the junior to intermediate bodyboarder, we were very surprised with the performance of the board in the water. This board makes catching waves easy, and thanks to its firm structure and thick EPS core, there’s a great deal of buoyancy and rigidity, meaning that this board performs well in small and big surf. The thick EPs core means that the board can withstand the immense pressure that can sometimes be thrown at a board in big surf, while the construction also means that it is easy to get up and running in small and slow surf that sometimes sees bodyboarders struggling. The HPDE slick bottom is absolutely fantastic in aiding you to ride smoothly and quickly on any size of wave, and reduces drag considerably, meaning you keep ahead of the wave and the whitewash – a must for any decent bodyboarder! Of course, as you would expect, this excellent bodyboard comes with a sturdy leash included which means your bodyboard won’t get away from you even when the wave gets away! The leash is every bit as well constructed as the board itself, and thankfully, quality is evident throughout the construction of the whole piece. Overall, the Atom Bodyboard is a fantastic starter bodyboard. Of course, you can spend more money on a bodyboard, but it is debatable as to whether or not you would be able to tell the difference. To a pro rider, there might be a few noticeable differences, but even for an intermediate bodyboarder, it would be extremely hard to tell this from something that costs two or even three times as much money. Whether you’re looking for something for the kids to play on in the summer surf, or you are after something that will stand the test of time as well as the test of the waves, the Atom should be your number one choice. There’s nothing that is both as affordable, and as well made on the market right now and there’s no doubt the Atom looks good too! Finished in a vivid blue colour, you can walk tall as you march toward the surf, knowing you have a board under your arm that won’t let you down. This entry was posted in Atom, Bodyboarding, Bodyboards, Reviews and tagged Atom, Atom Bodyboard, Bodyboard. Bookmark the permalink.